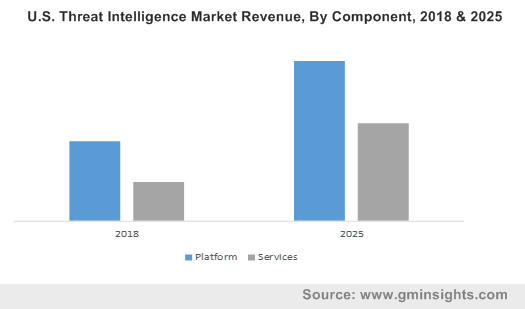 The ever-growing demand for internet-based services & rising penetration of IoT has propelled the growth graph of threat intelligence market. Nowadays organizations are rapidly embracing cloud platforms, IoT, and other networking technologies to enhance business productivity and reduce surplus cost, however, this has in turn led to rising concerns pertaining system security and growing reliance on threat intelligence solution to help identify common indicators of compromise (IOC) and to undertake necessary steps to prevent attack or infection. The primary purpose of threat intelligence, is to keep users informed of potential risks like zero-day threats, advanced persistent threats and exploits that can adversely affect computer programs, data or a network. According to reliable reports, companies in India experienced financial losses over $500,000 last year, owing to random cyber-attacks that caused losses in revenue, customers, opportunities, and out-of-pocket costs. The incidence is remnant of many such similar events that have led to an increased adoption of these solutions, which has helped supplement the threat intelligence market growth. As the number of internet users has increased exponentially, IT & telecom operators are constantly focusing on adopting enhanced security solution to predict and prevent cyber-attacks with an aim to offer uninterrupted services to critical sectors like banking. Indeed, cyber-attacks can greatly affect a telecom organization as they store sensitive customer information and offer critically unified communication services to client organizations. Threats such as DDoS attacks, network device vulnerabilities and human-related threats like insider access and the risk of allowing third-parties access to sensitive data have caused major financial losses to organizations earlier, which has promoted the adoption of network security systems lately. Furthermore, as more industries are relying on online operations, telecom & IT operators are investing heavily in threat intelligence solutions to predict and prevent losses from cyberattacks which will in turn augment the expansion of threat intelligence industry. A major component of threat intelligence that will garner widespread momentum in the years ahead is IAM. The rising acceptance of advanced technologies like cloud computing, BYOD and IoT will boost the threat intelligence industry size from Identity Access Management (IAM) ahead. The emergence of digitalization has encouraged organizations to build data-driven business models to make businesses more flexible, agile, and scalable, however, this has indirectly exposed organizations to privacy threats and insider attacks. To counter this issue, companies are adopting IAM solutions that allow IT managers to control user access to critical information within an organization. The system can be used to capture, store and manage user identities and related access permissions in an automated manner, ensuring that access privileges are granted according to proper authorization, authentication, and auditing policies. The system also allows businesses to operate more efficiently by reducing time, effort and money, further supplementing the expansion of the threat intelligence industry from IAM components. As a matter of fact, IAM-based threat intelligence market size is anticipated to register a CAGR of 14% over 2014-2025. Speaking of the regional spectrum, it is pivotal to mention that the Asia Pacific has emerged as a major ground for the threat intelligence market, driven by the rising number of smartphone and internet users in emerging nations. According to CNNIC (China Internet Network Information Center), China was reported to have a shocking 802 million internet users in the country – significantly more than the population of Russia, Mexico, Japan and the U.S. combined. Furthermore, the region is flooded with the presence of several ride-hailing, taxi-booking, food delivery, online banking and e-commerce companies that are primarily dependent on internet services to run operations. It would not therefore, be incorrect to quote that the growing dependency on the internet has led companies to focus more on adopting security solutions like threat intelligence to offer uninterrupted customer service to users and also to gain a competitive edge over rivals. Powered by the rising collaborations between government bodies and private cybersecurity providers and the increase in the number of cybercrimes in the region, not to mention, the rising proliferation of smart devices, APAC threat intelligence industry is expected to record a CAGR of 17% over 2014-2025. In a nutshell, threat intelligence, also called cyber threat intelligence, offers prior information to an organization regarding potential threats that can possibly cause damage to the organization. The information can be used to prepare, avoid, and identify cyber-attacks that take advantage of valuable resources and prevent unwanted losses. Considering the negative impact of the plausible scenario, the adoption of these solutions has become inevitable. As per estimates, the global threat intelligence market size will surpass $13 billion by 2025.